Voluntary Arts Week (15-24 May) celebrates the power of all those who create for themselves and for others. There are many events happening across the country but Knit for Peace would like you to take part in a way that suits you and the time you have to spare. 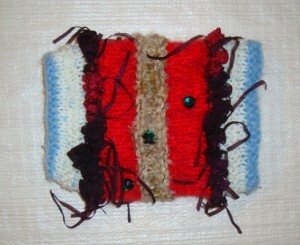 Knit for Peace is asking people to take some time out of their busy week to knit up a Twiddlemuff! A Twiddlemuff is a hand muff, with bits and bobs attached inside and out, designed to provide a stimulation activity for restless hands for patients suffering from dementia. Knit for Peace has been asked to provide these to NHS Hospitals in the UK, the patient then gets to take them home with them so there is always demand for more. It can be made with odds and ends of wool of different types and for anyone starting out on a limited budget local charity shops often have wool and needles (ask for these as they often can’t be displayed) and can supply all you need – or ask a friend who already knits! 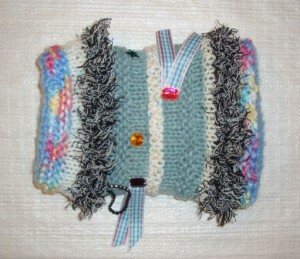 Knitting a Twiddlemuff can also be a fun group activity, members of the group can bring wool, ribbons, buttons and other trimmings to share and swap and enjoy the social aspect of knitting as a group. You can find a simple pattern for a Twiddlemuff here – but experienced knitters may want to experiment with other ways of creating this – perhaps using circular needles? Knit for Peace is a charity that supports those in need around the UK and overseas through the power of knitting. They accept donations of knitted items for distribution to people and groups and also donations of money (and left over equipment and yarn) to support projects that help people use knitting to achieve self-sufficiency, community cohesion and rehabilitation in locations both in the UK and abroad. So far in 2015 Knit for Peace has sent thousands of items of knitting to women’s refuges, homeless shelters, hospitals and orphanages. Knit for Peace distributes regularly to over 80 outlets including hospitals, women’s refuges, refugee drop in centres, prisons, community groups and hospices as well as to developing countries.